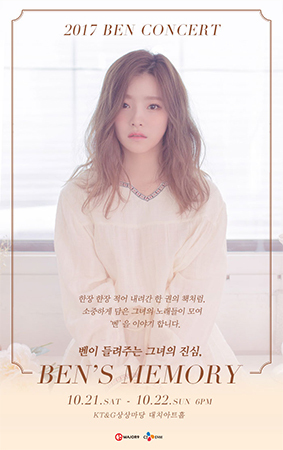 Singer Ben will be holding her first solo concert titled “Ben’s Memory” at Daechi Art Hall from October 21-22. It is the singer’s first solo concert since her debut in 2010. There is heightened anticipation for Ben’s solo concert as the singer successfully took part in her label’s month-long relay brand concert, “2017 The VIBE EXHIBITION.” She has also taken the stage as part of the 2016 hit musical “Death Note” further raising expectations for her upcoming concert.